19 Sep 2018 --- Premier Protein shakes will now feature FSC-certified – meaning the materials used have been responsibly sourced – Tetra Pak cartons and a re-sealable plant-based cap derived from sugarcane. Consumers are ever more mindful when it comes to making purchasing decisions, both in terms of personal nutrition and environmental footprint. Premier Protein – a line of shakes, powders, bars and clear drinks – has launched its new Earth First packaging for its ready-to-drink shakes, hoping to attract sustainability-seeking consumers. “An increasing percentage of consumers are now checking packaging labels to ensure the brand or product they're about to purchase is delivering a positive social or environmental impact,” Darcy Horn Davenport, President of Premier Nutrition Corporation, tells NutritionInsight. “This shift in consumer behavior inspired our team to evaluate Premier Protein's packaging and move towards sourcing more renewable resources. We value our customers above all else and aim to deliver good energy to people everywhere, and that includes protecting and restoring the health of our planet,” she adds. Premier Protein's new Tetra Pak carton is made mostly from paper, which comes from sustainably managed forests where trees can continue to grow. After they've been recycled, cartons can be turned into tissue, paper products and green building materials. The plant-based sugarcane cap is durable, protective, 100 percent recyclable and GMO-free. The sugarcane is sourced from Brazil and grown in a region of the country that does not upset ecosystems or food supplies. Additionally, by utilizing a resource that grows back each year, global CO2 emissions are significantly reduced in comparison to plastic made from petroleum. “Tetra Pak is excited to work with Premier Protein on the new Earth First packaging initiative,” says Gustaf Rabe, Vice President of Aseptic Sales, Tetra Pak US & Canada. New Premier Protein Earth First packaging will be available across the shakes' seven-flavor portfolio, which includes Chocolate, Vanilla, Strawberries & Cream, Bananas & Cream, Caramel, Peaches & Cream and Cookies & Cream. 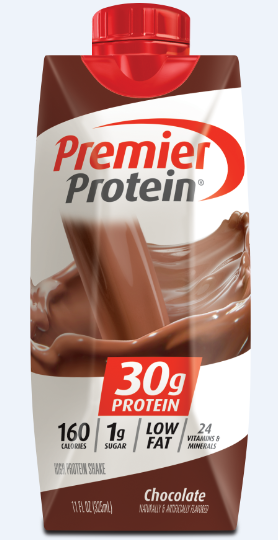 “In the year ahead Premier Protein will launch new products and expand availability, including new shake flavors and a 14oz shake in convenience stores. 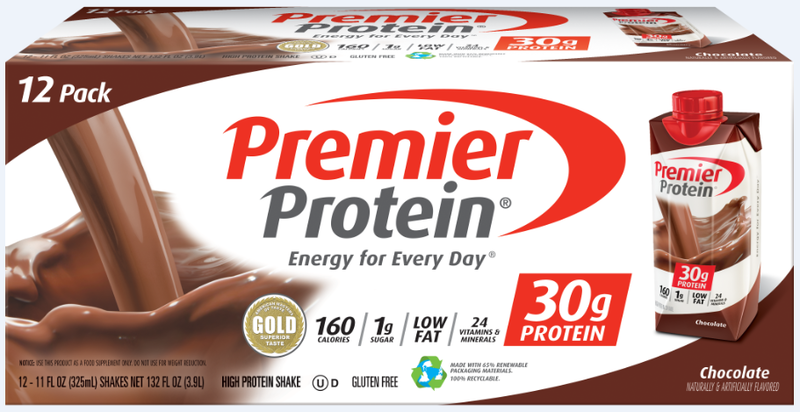 We’re also bringing the Premier promise to the bar category; that is, high protein, low sugar and calories,” adds Jennifer Greenberg, Director of Marketing, Premier Nutrition Corporation.